An entire city police force in the Philippines has been fired in metropolitan Manila after some of its members were suspected in the gruesome killings of three teenagers and others were seen on surveillance cameras robbing a house. The 1,200-strong Caloocan city police force will be relieved in batches and replaced, said metropolitan Manila police chief Oscar Albayalde. The officers will undergo 45 days of retraining, after which those facing no charges can be reassigned to other stations. 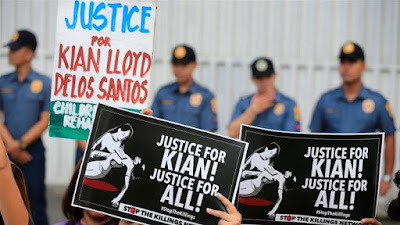 The parents of two other teenagers - 19-year-old Carl Angelo Arnaiz and 14-year-old Reynaldo de Guzman - have also filed murder, torture and planting of evidence complaints against two Caloocan policemen. Seriously can we give their government a standing ovation coupled with a round of applause?Seriously can we? Thank you.